The Spierig brothers’ Predestination and Russell Crowe’s The Water Diviner lead the film nominees while The Code and Please Like Me head the contenders in the TV categories in the 4th Australian Academy of Cinema and Television Arts (AACTA) Awards. Predestination received nine nominations, followed by The Water Diviner with eight, seven for David Michôd’s The Rover and six apiece for Jennifer Kent’s The Babadook, Josh Lawson’s The Little Death and Jonathan Teplitzky’s The Railway Man. Culled from 25 eligible titles, Predestination, The Water Diviner, The Babadook, Rolf de Heer’s Charlie’s Country, The Railway Man and John Curran’s Tracks are vying for best feature. Perhaps surprisingly, Crowe was overlooked for best director, which will be a battle between the Spierigs, Kent, de Heer and Michôd. The contenders for best TV drama are Endemol’s Puberty Blues season 2, Playmaker Media’s The Code, Screentime’s Janet King and Essential Media and Entertainment’s Rake series 3. The Puberty Blues nod marks the 16th nomination for prolific producer John Edwards in 14 years and the sixth jointly for Edwards and his producing partner Imogen Banks. In feature documentaries Kitty Green’s Ukraine is not a Brothel leads the race with six noms, with five for Lynette Wallworth’s Tender and four each for Eddie Martin’s All This Mayhem, Christopher Houghton’s Sons and Mothers and John Bruno, Andrew Wight and Ray Quint’s Deepsea Challenge 3D. The nominees were announced this afternoon by Susie Porter and Dan Wyllie in an event at The Star hosted by Rob Carlton. Round two of feature film voting for AACTA members opens today at 5 pm and closes at 12 noon on January 5. The candidates for best lead actor are Water Diviner’s Crowe, David Gulpilil (Charlie’s Country), Guy Pearce (The Rover) and Damon Herriman (The Little Death). Up for best lead actress are Mia Wasikowska (Tracks), Essie Davis (The Babadook), Sarah Snook (Predestination) and Kate Box (The Little Death). The Code will compete in 10 TV categories, with six noms for Josh Thomas’ Please Like Me and five apiece for Essential Media and Entertainment’s The Broken Shore and Rake 3 and Story Ark Productions’ Carlotta. In the running for best lead actor in a TV drama are Luke Arnold (INXS: Never Tear Us Apart), Ashley Zukerman and Dan Spielman (The Code) and Richard Roxburgh (Rake 3). Contenders for best lead actress in a TV drama are Kat Stewart (Offspring season 5), Ashleigh Cummings (Puberty Blues season 2), Danielle Cormack (Wentworth series 2) and Marta Dusseldorp (Janet King). Nominated for best TV comedy are Please Like Me, Working Dog’s Utopia, Jungleboys’ The Moodys, Princess Pictures’ It’s a Date series 2 and ITV Studios Australia’s Shaun Micallef’s Mad as Hell series 3. Shine Australia dominates the best reality TV series category with noms for MasterChef Australia series 6, The Voice Australia and The Voice Kids, against FremantleMedia Australia’s The X Factor. Up for best TV documentary are Eva Orner’s The Network, Tender, Brilliant Creatures: Germaine, Clive, Barry & Bob, and Taking on the Chocolate Frog . Nick Cave and Warren Ellis are among the nominees for the new award for best original music score in a documentary, with Jed Kurzel (All This Mayhem), Jed Palmer and Zoë Barry (Ukraine is not a Brothel) and Ricky Edwards, Brett Aplin and Amy Bastow (Deepsea Challenge 3D). AFI | AACTA CEO, Damian Trewhella, said: “This year has been a great year for the Academy, and a strong year for competition in our screen industry. “The Academy has seen a five year high in the total number of entries (combined across all categories) for the 4th AACTA Awards, and we’ve achieved record high voting for the 4th AACTAs. “Australian television production has been prolific this year, with more than 50 productions entering the Awards, and 35 television productions receiving nominations, representing healthy competition." 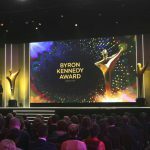 The winners will be revealed at AACTA Awards luncheon on January 27 and at the Awards ceremony on January 29, the latter telecast on Network Ten.